John died at his residence on Monday, September 8, 2008 at 2:10 AM. He was born January 16, 1933 the son of Joseph Anthony and Gladys Ensey Rose (Blake) Ratermann. They are deceased. He was married to Kathryn Houck on August 25, 1962 and she survives along with six children, Joseph and wife Ivana of Ft. Lewis, Washington; Joanna Ratermann of Troy, Ohio; Karla and husband David Cole of Sidney, Ohio; John R. Ratermann of Englewood, Ohio; Kay Ratermann of Sidney, Ohio and Jeanne and husband Ken Sheppard of Kettering, Ohio; 10 grandchildren, Daniele Cole, Brittani Jackson, Matthew Evans, Ashley Ciriegio, Robert Centers, Alyssa Clark, Megan Cole, Adam Sheppard, Sophie Ratermann, and John Joseph Ratermann and 4 great-grandchildren, Wyatt Anthony Jackson, Montgomery Ryan Evans, Warren Matthew Jackson and Dakari Ty Evans; sisters, Catherine (Kate) and husband William Custenborder of Versailles, Ohio; Betty and husband Robert Roeckner of Kettering, Ohio and Barbara Brubaker of Sidney; he was baptized and a life long member of Holy Angels Catholic Church. He attended Holy Angels Catholic Grade School from 1939 until 1947. Then he entered St. Gregory&#39;s Seminary for studies to the Catholic Priesthood. He had four years of high school and two years of liberal arts studies in the Lower Division of the Athenaeum of Ohio. Two additional years of liberal arts, BA with major in Philosophy; three additional years of Theology at the Upper Division of the Athenaeum of Ohio. Had graduate studies in mathematics and education and counseling at Xavier and graduate studies in Business at Wright State University. After leaving the seminary, he spent two years in the United States Army. One year at Ft. Knox, the second year at ASCOM Area Command, Korea. He was at WABCO from 1960-61. He was a teacher from 1961-1973 at Holy Angels High School becoming Lehman High School after the consolidation. 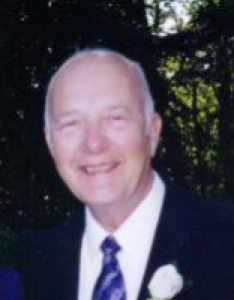 He taught many and varied subjects, Latin, World History, Algebra, Civics, American History, Economics, Speech, Religion, and was the Senior Class Guidance Counselor. He was the Freshman, Sophomore, Junior, Senior Home Room moderator/advisor and followed the class of 1965 in those first four years. He was the extraordinary minister of The Eucharist under Bishop Leibold; was Moderator Student Council, Senior Class Play Director. From 1973-1998 he was employed at Copeland Corporation, retiring in 1998 as a material specialist. In 2000 he visited his son Joe in Germany and the highlight of his life was walking the farm of the Ratermann family of the 1850&#39;s. In 2002, he was a volunteer at Dorothy Love Retirement Community for the Thursday Catholic Hour. He was a member of the Holy Angels funeral choir and was a very devout Catholic all his life. A Mass of Christian Burial will be held on Thursday, September 11, 2008 at 10:30 AM at Holy Angels Catholic Church with Rev. Eugene Van Der Haar and Rev. Dan Schmitmeyer. Burial will be at Graceland Cemetery, Sidney. Friends may call at Salm-McGill and Tangeman Funeral Home in Sidney on Wednesday, September, 10, 2008 from 4-8 PM. Memorial contributions may be made to Wilson Hospice, 1081 Fairington Dr., Sidney, Ohio 45365 or to Lehman High School, Tuition Assistance Fund, 2400 St. Mary&#39;s Rd., Sidney, Ohio 45365. Envelopes will be available at the funeral home.